It has had more than £9 billion spent on its regeneration, and boasts a modern transport hub, Europe’s biggest shopping mall and the vast Queen Elizabeth Olympic Park. 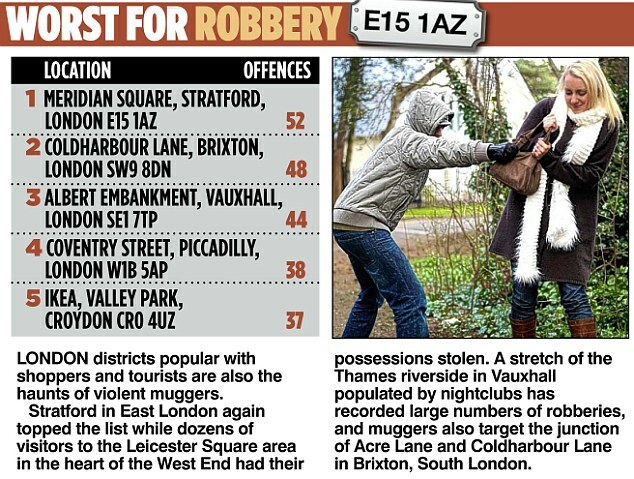 But today Stratford in East London is awarded a less welcome accolade as the country’s worst crime hotspot – a magnet for muggers, pickpockets and thieves. 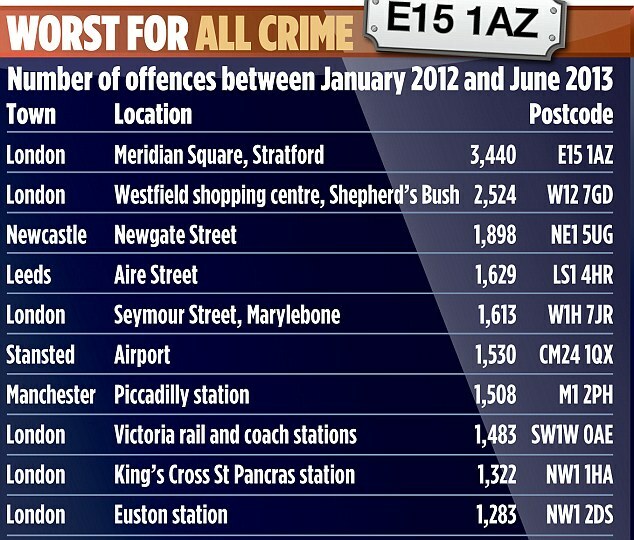 Analysis of official police figures by The Mail on Sunday reveals that the postcode covering the huge Westfield Stratford City mall is plagued by almost 200 offences every month. 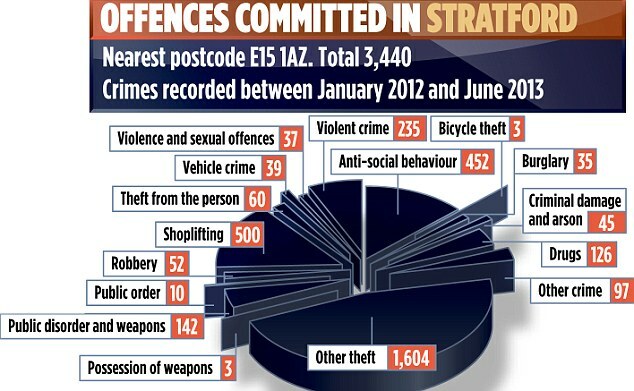 Scotland Yard has recorded 3,440 crimes in the area over the past 18 months, including 500 shoplifting offences, almost 300 violent crimes and hundreds of pick-pocketings and muggings. Just last week five thugs were jailed over a gang fight inside the Westfield Stratford centre in which a young man, Liam Woodards, was stabbed to death in front of horrified shoppers. In a further blow to the mall’s Australian owners Westfield Group, its other London shopping centre in Shepherd’s Bush emerges as the site with the second-highest number of crimes – 2,524. Airports where weapons are often seized from foreign visitors, railway stations haunted by beggars and football hooligans, and high streets where drinkers gather also see large numbers of arrests. 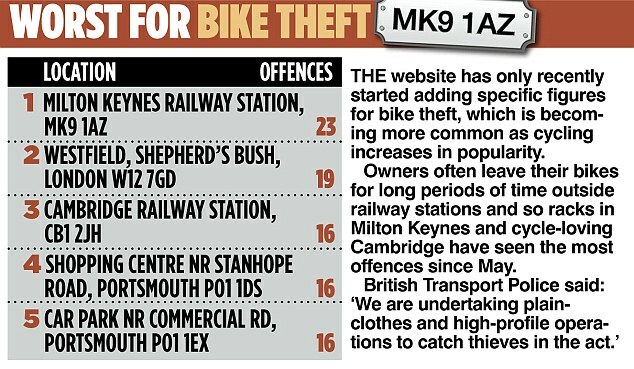 But this newspaper’s pioneering research has also uncovered some unlikely crime hotspots. They include a hospital in Northern Ireland where hundreds of violent attacks have been recorded, and a seaside resort on the South Coast that has suffered more burglaries than anywhere else. Music festivals such as Glastonbury also trigger huge spikes in the usually sleepy countryside. It is the first time that crime rates have been compared for every postcode in England, Wales and Northern Ireland, each covering just a few hundred yards, over the course of more than a year. The data was taken from details uploaded by every police force in the country to a website maintained by the Home Office. Nick Herbert, the former Policing Minister who has championed crime maps, said last night: ‘The power of crime mapping is putting information in the hands of people. Labour first developed the idea of plotting police records on maps that residents could search online to see how safe their neighbourhoods were, following successful projects in America. The website crashed from high demand when it was launched nationwide in 2009. 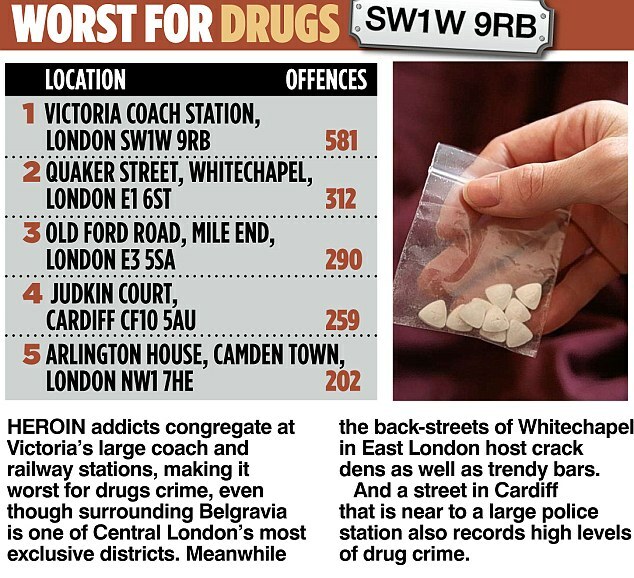 But it initially showed only offences across wide districts in a single month, and even when the Coalition unveiled more precise data in 2011 there was criticism that some streets were wrongly being labelled crime hotspots. A quiet street in Gloucester was branded the country’s worst place for anti-social behaviour – but only because dozens of hoax 999 calls had been included in statistics. 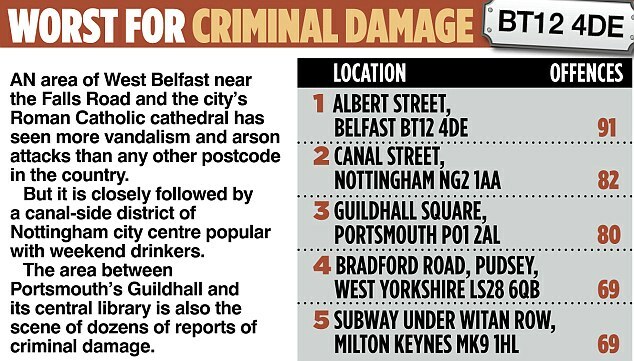 Householders feared the maps could damage property prices and even put up their insurance premiums. Since then forces and Home Office statisticians have improved the site so it narrowed down the location of incidents, listed a greater number of crime types and even revealed if the perpetrator has been caught. Public places including railway stations and parks were added. The website, which costs £28,000 a month to maintain, was visited an estimated 548 million times in its first two years. It also allows anyone to upload the specific details of every offence to a spreadsheet, where they can be separated by type of offence and where the changing level of disorder can be plotted over time. The Home Office website, police.uk, allows anyone to export details of crimes to a spreadsheet. These records include the type of offence, the force which recorded it, the month in which it took place and – crucially – its location. Police plot the crime to one of more than 750,000 points on a map, which they anonymise slightly so that individual houses are not identified, in order to protect victims. 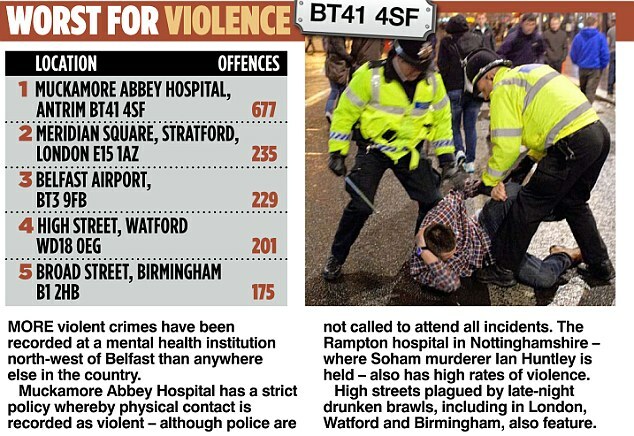 This mapping information was translated into individual postcode data by The Mail on Sunday, so that every area’s crime rates and trends could be compared and studied over time. Police pinpoint the exact location of every crime they investigate, but to preserve the privacy of individual victims the setting is widened slightly when it is published online. The Mail on Sunday has studied the details of all the offences recorded between January 2012 and June 2013 by the 44 forces in England, Wales and Northern Ireland, plus the British Transport Police. They show that 8,950,327 crimes took place in 548,171 individual postcodes, with more than half of areas suffering fewer than ten offences over the past year and a half. 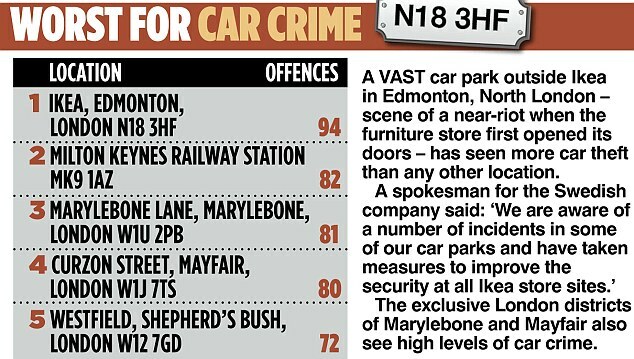 Meridian Square – the public area that links Stratford’s bus and rail stations, the Westfield shopping centre and the entrance to the Olympic Park – emerged as the place with the highest number of crimes to its name: 3,440, or 6.7 a day. This postcode, E15 1AZ, saw a record 291 offences in January this year. Twelve months earlier there had been just 73, while criminality also increased last summer as millions of spectators arrived to witness the London Olympics. A spokesman for Scotland Yard said: ‘In addition to the Olympic Games which attracted hundreds of thousands of visitors, 12 concerts and anniversary athletic events have recently taken place, with an extra 660,000 people attending. The Met added that robbery had fallen by 5 per cent over the past 12 months in Newham, the borough where Stratford is situated, and that anti-social behaviour orders were being used to tackle ‘prolific shoplifters’ as crime across the capital fell to its lowest level for a decade. Senior Newham councillor Richard Crawford said: ‘We have a zero- tolerance approach to crime and anti-social behaviour in Stratford and across Newham. ‘Safety remains our residents’ No 1 concern and we are investing more in making Newham safer. The council funds police community support officers and has set up a ‘dispersal zone’ so gangs of youths can be kept away from the centre of Stratford. 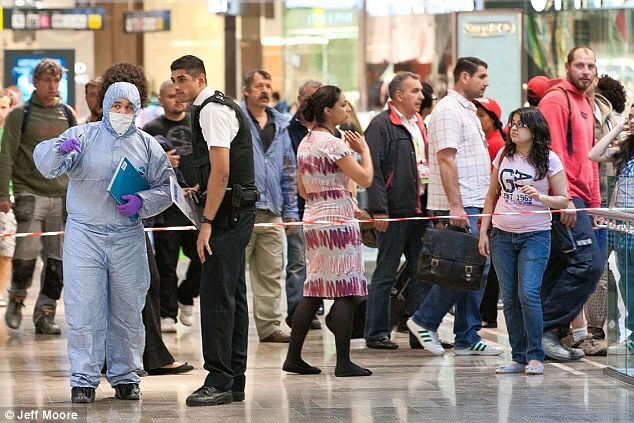 A spokesman for Westfield insisted the postcode covered a wider area than its shopping centre alone, and added: ‘As a proportion of high customer numbers visiting our centres, the incident levels at Westfield are very low. Britain’s crime maps show slightly different pictures when larger districts are compared. The postcode area – covering dozens of buildings – registering the highest number of crimes is still E15 1, but it is followed by NE1 5 in central Newcastle and DE1 1 in Derby. 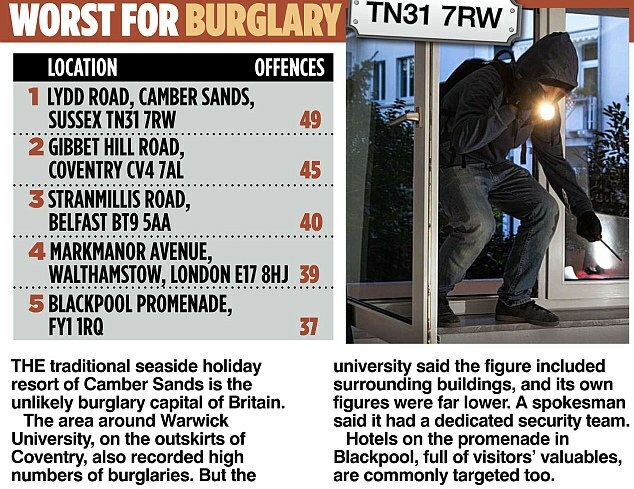 The wider postcode district – covering areas where about 20,000 people live – with the highest number of crimes turns out to be CR0 in Croydon in South London, followed by SE1 on the south bank of the Thames and NW1 in Camden, North London. In the most recent month for which figures are available – June this year – Castle Donington in Leicestershire was the postcode with the highest number of crimes (300) as the Download music festival came to town, followed by Pilton in Somerset, with 220 – site of the Glastonbury music festival. Third was Meridian Square in Stratford (202 offences) and fourth was Finsbury Park in North London, where the Stone Roses played two gigs (167 crimes).